October begins well as we begin 31 days if terror at QuasarDragon. * Although we will have as many, if not more, fantasy and science links as usual, there will a greater emphasis on fear until the horrors of All Hallow's Eve are washed away by the insipidness of All Saints' Day. 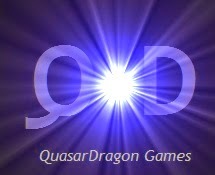 *QuasarDragon is not responsible for wet pants, heart palpitations, feeling of paranoia, or embarrassment as you run screaming in terror like a frightened child from these free frights. • At AE: "Nothing, Ventured" by James Beamon. Science Fiction. "Dr. Anatoly Iburruri hungered for nothing, and hungered for it relentlessly. It was out there, waiting for him to find — something that wasn’t something. While other scientists flash-heated liquids or supercooled solids trying to find new, undiscovered particles and elements to name after themselves, Anatoly searched for naught." • At Aurora Wolf: "Home and Garden Show" by Juliana Rew. "Failing to decide is a decision. I flip the handmade slugs over and between my fingers like a magician with a coin. I made them myself to a fine tolerance. The action soothes me. I let them fall back into their coffer, slide it to the back of the drawer, and lock it. I wonder if the time has come. . ."
• At The Colored Lens: "Leaky Magic" by Judith Field. Urban Fantasy. "It was dark by the time Mark Anderson opened his front door and staggered into the house clutching the dead weight of the shoebox to his chest. He gagged as manure-smelling blue slime oozed from the base of the box, down his suit jacket and onto the hall rug. He pushed the door shut and put the box on the hall floor." • At GigaNotoSaurus: "Mother Roughcoat and Aunt Far Away" by Patricia Russo. "Mother Roughcoat lived in a one-room shack in the center of the city. She wasn’t, and never had been, anybody’s mother, but because she was older than the municipal hall, or looked it–in truth, she looked older than the Foundation Fountain, and that thing was crumbling to sand–people called her Mother out of an old-fashioned sort of politeness." • At Lightspeed: "Help Fund My Robot Army!!!" by Keffy R. M. Kehrli. Science Fiction. "As late as ten years ago, a mad scientist with a dream could expect to turn a decent profit with his lesser inventions and build enough capital to put his (or her!) real plans into play. Those days are sadly over, although my father, fool that he was, claimed that they never existed." • At Lightspeed: "Augusta Prima" by Karin Tidbeck, Fantasy. "Augusta stood in the middle of the lawn with the croquet club in a two-handed grasp. She had been offered the honor of opening the game. Mnemosyne’s prized croquet balls were carved from bone, with inlaid enamel and gold. The ball at Augusta’s feet stared up at her with eyes of bright blue porcelain." At Daily Science Fiction: "The Gifts: Part One" by Mari Ness. Fantasy. At Every Day Fiction: "Local Woman is 69 but Looks 21" by George S. Walker, Horror. At 365 Tomorrows: "Roboy" by Mae Thann. Science Fiction. • At Anthropomorphic Dreams Publishing: "A Place to Belong - part 2" by Eric Luhman. Anthropomorphic Fantasy. "Kevin the human decides to face the challenge and prove he has the right to be part of the dragon clan. It will not be easy though. It will take all his strength and cunning and he might very well be fighting for his life…"
• At Lightspeed: "Help Fund My Robot Army!!!" by Keffy R. M. Kehrli, read by Stefan Rudnicki. Science Fiction. • At Protecting Project Pulp: "The Sea Witch" by Nictzin Dyalhis, read by Fred Himebaugh. Horror. "Out of the sea she came, this gloriously beautiful woman, to compass a weird revenge that had been too long delayed." first published in Weird Tales, December 1937.